Going to Las Vegas on a gambling vacation may appear like a good deal on paper, especially if you decide to book a package that includes your transport to the city, your accommodation, and perhaps even some of your meals. However, the one part that’s difficult to budget for is the gaming itself. Of course, you can set yourself a spend limit when it comes to gaming, but do you have the self-discipline to stick to that limit? Also, do you know the best ways to stretch your gaming dollar when you’re in Sin City? These tips may help you get more bang for your buck! When you play games on a site like 32Red casino, it’s really easy to find out what player return is available on each game and so you can pick your games with care, so that each time you place a bet, the odds are as much in your favour as possible. In Las Vegas, many people stick to playing slots as they don’t feel confident enough to go up to the gaming tables to play roulette or blackjack. However, these games offer better player odds, so it’s worth brushing up on your playing skills of table games before you go to Vegas. The other advantage of table games is that the games take longer to play. So for each bet, you get more minutes of entertainment than you would from a slot for the same amount of cash, whether or not you win or lose. Games that move at a slower pace will stretch out the gaming fund that you take with you to Vegas. Every establishment that you go to in Vegas, you’ll see there is a players’ club to sign up to. Take a big wallet with you and stuff it full of these loyalty cards as they’ll get you lots of freebies (known as comps) and discounts on food and entertainment. If you sign up online to a few different players’ clubs, then you’ll be sent vouchers to take with you on your trip to Vegas, and be able to make savings from day one. The casinos on the Strip are big, brash and beautiful. But when you game there, you’re gaming at a premium price – paying a little bit extra in terms of the house edge in order to enjoy the sumptuous surroundings. 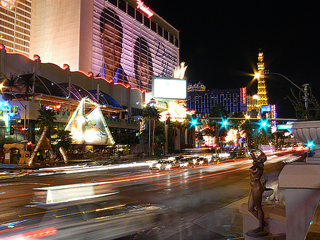 Spend time at the Strip casinos, taking in the sights, but save your actual gaming for the casinos further out of town or in the downtown area where the locals play. There, you’ll find that you get better player odds on the games, as this is what the locals demand. Following the tips above will help extend the value you get when gaming in Las Vegas, but you should still be prepared to come home feeling broke. The casinos generally win more than the players! But you’ll have had fun on your trip and then you can always get back to some free gaming online at 32red in practice play mode when you’re back home.